After taking five months off from launching new games, Playdom has a dozen releases planned for the upcoming fiscal year, several of which will finally leverage Disney’s big brand names. In an interview in Silicon Valley, Brad Serwin, the COO of Playdom’s social games unit, said the company has finally started to come out of hiding after being acquired for $563.2 million, plus a $200 million earn-out, more than a year ago. One reason it took so long, according to Serwin: The general pains of integrating a small company into a larger organization. Since the acquisition, Playdom has moved to new offices in Palo Alto, Calif., which it shares with Disney Mobile (which was formed through the acquisition of another Silicon Valley start-up, Tapulous). Both have been learning to work with a parent company that is headquartered 350 miles away. Since then, games have become the most popular applications on the platform, and have evolved from simple and inexpensive time killers to graphically rich applications. Facebook has changed the rules, too. This has impacted everyone in the space, not just three-year-old Playdom. Two of the biggest challenges emerged when the social network shut down its viral channels: When it became difficult to acquire new users by posting messages on users’ pages, and when Facebook implemented Credits, a virtual currency that requires developers to cut Facebook 30 percent of all revenues. Playdom execs believe the company has finally reorganized, and are planning on making a big splash in what many worried was a dead pool. Of the dozen titles slated for the next year, two games will come as soon as this month, and up to three games — coming in January, March and August — will leverage Disney brands. 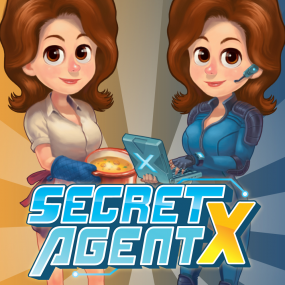 Playdom’s next game is called Secret Agent X. For now, it is only available in beta in some international markets, but it is coming to the U.S. in the fall. In the game, a player leads a dual life as an average citizen who at night becomes a secret agent, exploring new locations and completing missions with the help of high-tech gadgets. In the trailer for the game, seen below, a suburban housewife manages to save the world, all the while keeping her cover by making sure dinner is on the table on time. As the seventh-largest app maker, according to AppData, Playdom falls below Zynga, Electronic Arts and even such new entrants as Germany’s Wooga. 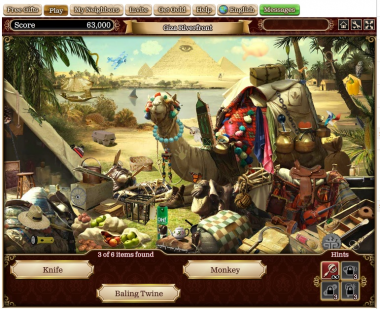 The concept behind hidden objects is not new to gaming, but it is new to Facebook, and was recently identified as a niche worth pursuing. Today, Playdom’s game is garnering nearly three million daily active users, which registers slightly below Zynga’s new Adventure World. Playdom hopes it will prosper by bringing new concepts to social gaming and also by leveraging Disney’s big brands to catch players’ attention. As a recent test, Playdom renamed its game GnomeTown as Disney’s GnomeTown. Serwin said the game performed much better with the new name. Playdom’s close competitor Playfish is also relying on the intellectual property of its parent company, Electronic Arts. It has seen its Sims Social title climb the charts to become the second-most-popular game. On the other hand, Zynga, which is the largest social games maker, has made up all of its own properties, ranging from FarmVille to its newest property, Adventure World. More recently, it has used name-brand promotions within its games to garner attention, such as Lady Gaga in FarmVille, and more recently, Enrique Iglesias in CityVille. Serwin said the Playdom division’s plan is to work closely with Disney; it has hired a liaison who works in Burbank every day to make sure Playdom’s plans are on course with what Disney has in mind. Still, Serwin can’t deny that the lull in game making has dragged down the results of Disney’s Interactive Group. Disney reported $21 million in accounting adjustment in the third quarter and $34 million in the second quarter tied to Playdom alone, and the losses are expected to continue. Iger declined to say when the group would hit break-even, but that it was expected to get into the black by 2013. Iger gave Gardens of Time as an example of a game that is monetizing well. “We feel good about the direction of Playdom, particularly with this new hit game in the marketplace,” he said, adding that new games in the pipeline will be based on Disney, ESPN and Marvel brands. It has taken more than a year, but Serwin believes Playdom is ready.